When cyclohexene reacts with chlorine in carbon tetrachloride the trans-dihalide is formed. 1. Write the complete stepwise mechanism for this reaction. Be sure to show all intermediate structures and all electron flow using arrows. 4. Provide the IUPAC name for the product of the reaction of cyclohexene with bromine. 5. 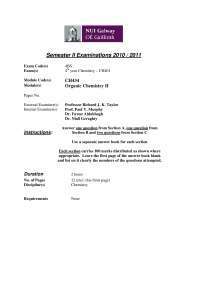 Draw both chair conformations of trans-1,2-dichlorocyclohexane on the templates provided below. Circle the least stable conformation. 6. 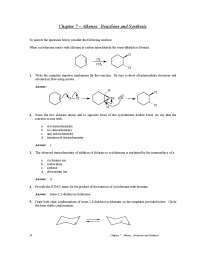 Write the complete reaction mechanism for the first step of this reaction sequence. Show all electron flow with arrows and show all intermediate structures. a. carbocation b. cyclonium ion c. mercurinium ion d. mercapto species. Consider the reaction below to answer the following questions. 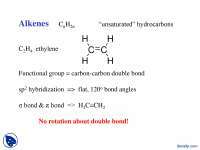 Alkenes may be hydrated by the hydroboration/oxidation procedure shown. a. a rearrangement reaction. b. a substitution reaction. c. an elimination reaction. d. an addition reaction. a. anti stereochemistry. b. trans stereochemistry. c. syn stereochemistry. d. unpredictable stereochemistry. a. Markovnikov. b. non-Markovnikov c. subject to solvent effects. d. unrelated to alkene structure. When dichlorocarbene is generated in the presence of an alkene, a dichlorocyclopropane is formed. 13. Write the complete stepwise mechanism for the formation of dichlorocarbene, :CCl2. Show all intermediate structures and show all electron flow with arrows. 14. Draw the complete Lewis electron dot structure for dichlorocarbene, :CCl2. a. electrophile. b. Lewis base. c. nucleophile. d. both b and c.
a. regiospecific. b. Markovnikov. c. stereospecific. d. non-Markovnikov. The sequence of (1) alkene hydroxylation followed by (2) diol cleavage is often an excellent alternative to direct alkene cleavage with ozone. For this sequence below, answer the following questions. 17. Draw the structure of A. 18. Give the formula for reagent B. Predict the products of each reaction below. Indicate regiochemistry and stereochemistry when relevant. Choose the best reagent from the list below for carrying out each transformation. Place the letter of the reagent in the blank to the left of the reaction. 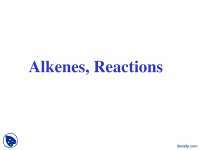 For each reaction below suggest structures for alkenes that give the indicated reaction products. There may be more than one answer in some cases. In an abandoned laboratory has been found a flammable liquid, A, in a bottle bearing only the label “Compound A: C H7 12 .” Government agents have offered you a considerable sum to determine the structure of this compound. After verifying the molecular formula by elemental analysis, you find that Compound A reacts with 1 mol equiv of hydrogen and, after treatment with acidic KMnO4 , gives the dicarboxylic acid C (see below). Another bottle from the same laboratory is labeled “Compound B (isomer of A).” Compound B also reacts with 1 mol equiv of hydrogen, but yields cyclohexanone after treatment with acidic KMnO4 . 40. 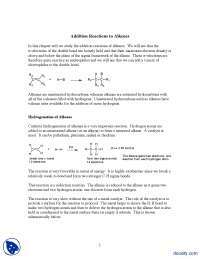 How many degrees of unsaturation does Compound A possess? Answer: A saturated seven carbon compound should have the formula C7H16 so compound A has 16 12 2 2−( ) ÷ = degrees of unsaturation. 41. Suggest structures for A and B. 42. 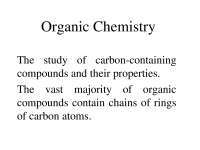 What was the other product formed in the KMnO4 oxidation of B? 43. Lyapolate Sodium, whose structure is shown below, is used as an anticoagulant. Identify the monomer unit(s) in lyapolate sodium. 44. Povidone is produced commercially as a series of products having mean molecular weights ranging from about 10,000 to 700,000. Complexed with iodine, povidone yields an iodophor, marketed under the tradename Betadine, which is used as a topical anti-infective. Identify the monomer unit(s) in povidone.